This is a great way to get back in the groove of blogging after a long holiday weekend! Every Sunday night, Java posts 5 questions to answer then link back to. It's a great way to learn a little more about friends we follow through blogging. Chicken strips on a salad. With honey mustard dressing. Made by someone else. Nope; it's still high school football season here in the Small Town! 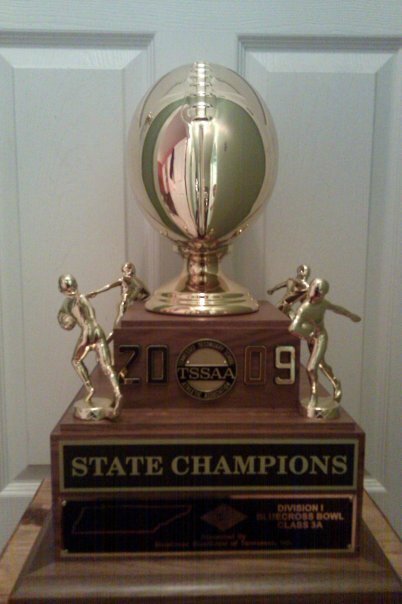 Friday, the football team is going for their 7th State Championship in 7 years; their 12th total. Hmmmm....that's a tough question. I don't know that I just have one. I really like my pj's, especially my flannel pj's that I wear in the winter. I usually stay in them all day on New Year's Day! Then there's my sweatshirts. Can do without them! I definitely prefer my winter clothes. Mostly online. I still do a couple by check. I make quite a bit of candy, but not many cookies. I just can't get the hang of cut-out cookies, although Pillsbury does make a mean gingerbread cookie dough, so all you have to do it roll it out and cut away! The only problem is that it makes 15 gazillion cookies. I do make this amazing Candy Cane Cookie by Pampered Chef. Really easy and just incredibly delicious! Preheat oven to 350 degrees. Form dough into a ball and place into center of 15" baking stone (I would think you could put it into a cookie sheet that has been sprayed or prepped with parchment paper.). Flatten slightly with palm of hand. Lightly flour dough and rolling pin. Roll dough into a 14" circle. Bake 18-20 minutes or until golden brown. Mmmmmm thanks for that recipe! I'm definitely trying those! Haha made by someone else. That's key. Everything tastes better made by someone else! Have a great Monday! that salad looks delicious!! Good luck to the football team; that is a pretty impressive record!! That recipe looks like a good one to make for the holidays; might have to try it out! hope the week ahead is a good one! Thanks for the recipe for the Candy Cane Cookies. I hope you have a great week and Good Luck to the Football team! Wow, that must be some football team in your small town! Good luck to them, but it doesn't sound like they need it! The cookie recipe sounds delicious, thanks for sharing. We are definitely making that Christmas cookie you posted about! We just decorated this weekend. The husband was in a festive mood I guess. It is fun to see the kids get so excited about decorating. I will definitely be trying that recipe!! I make a lot of cookies and love to try new recipes, especially if they're simple to do...thanks for sharing! I looooove online bill pay! It is so convenient!! I have some embroidered sweatshirt jackets that I wear in the winter and cooler weather that I love! They are so comfortable! Good luck to your football team! Wow! Going for their 7th Championshp! That is awesome! We could certainly do chicken together! 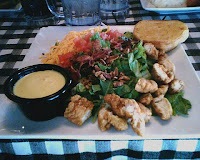 Have you ever had O'Charley's Pecan Chicken Tender Salad? Oh. My. Gosh! It's the best! Yup - I'm with you on PJ's. love mine too. The cookie recipe looks good as well, may try that one out. Have a great day. Thanks for the recipe....and I am with you on the pjs. Loved your responses. Those cookies sound awesome!! I'm going to have to find some time and try them!!! I'd have to say I prefer winter clothing to summer clothes also. Thanks so much for stopping by The House on the Corner! I signed up to bring cookies for our luncheon. Think I'll try these. Thanks for the idea. hi there!Looks like that cookie recipe is a big hit!=)I will just have to try it!! i also prefer my winter clothes!I love that warm snuggly feeling! Visiting you via the blog hop & following! Thanks for the recipe. I am way behind in my reading. Have a nice weekend.